Keynote lecture “Does the market Trump politics?” at the Environmental Economics International Conference: A Focus on Natural Resources. Orléans, France, 5-6 April 2018. “Climate policy from Paris to Trump and beyond”, speaker at Eighth Annual Economics for Energy Workshop, Madrid, Spain, 15-16 February 2018. Speaker at Séminaire du Conseil Économique pour le Développement Durable: Quel cadre fiscal pour accélerer la Transition écologique et solidaire? Arranged by Ministère de la Transition Écologique et Solidaire, Paris, 13 February 2018. Presentation at seminar “Europaperspektiv 2018 – EU I en världsordning under omvandling”. Norra Latin, Stockholm, 7 February 2018. Participation in Third International Workshop: The Energy Transition in Land Transportation. Ecole Normale Supérieure, 9-10 november 2017. Keynote at conference Global (Dis)Order and Development at Gothenburg Centre of Globalization and Development, University of Gothenburg, 6-7 November 2017. Participation in session “The research landscape if climate economics” at workshop “Challenges for Economics Research on Climate Change after Paris”, Villa Vigoni, Italy, 2017-05-04. Presenting “International climate economics: the importance of treaties and politics versus underlying trends in technology and taste” at international workshop “The economics of climate change and sustainability”, Rimini Campus, University of Bologna, 2017-04-28. Participation in seminar “Vägen till samarbete kring de globala utmaningarna”, Jonsereds Herrgård, 2017-04-26. Research keynote speech “Policy instruments for realizing a green economy in Ethiopia” at 1st Annual Conference on Ethiopias’s Green Development Path – The Implementation of a Mainstreamed CRGE. Hilton Hote, Addis Ababa, 2017-04-25. Presenting the paper “International Climate Economics” at the Department of Economics, University of Lisboa, Portugal, 2017-02-24. Plenary speaker at Fifth Annual Conference for Italian Association of Environmental and Resource Economists (IAERE) at University of Rome Tor Vergata, School of Economics, 2017-02-16. Presentation at Eolus annual meeting, Hässleholm, 2017-01-28. Presenting “Gröna skatter” at seminar ”Skattereformen 25 år – dess historia och framtid”. Seminar in Swedish Parliament on tax reform, Stockholm, 2017-01-25.Presenting ”Carbon tax as an option in designing climate policies”, FSR Climate Annual Conference at European University Institute, Florence, 2016-12-01. Invited speaker at Forum för giftfri miljö, Västerås, 2016-11-16. Presenting ”Vad betyder Parisavtalet för näringsliv och samhälle?” at Hagainitiativets frukostmöte , Universeum, Gothenburg, 2016-10-21. Presenting ”Klimatavtalet från Paris – utmaningen att gå från ord till handling” at Sustainability Day at School of Business, Economics and Law, University of Gothenburg, 2016-10-18. “Ekonomiska perspektiv på klimatfrågan”, panel discussant at the Swedish National Conference in Economics at the School of Business, Economics, and Law, University of Gothenburg, 2016-09-30. Presenting ”Refunding emissions payments” at the Swedish National Conference in Economics at the School of Business, Economics and Law, University of Gothenburg, 2016-09-30. Presenting “Att möta klimatutmaningen”, Tuvedialogen lecture, Glöstorpskyrkan, Gothenburg, 2016-09-22. “Environmental Causation and Public Health”, speaker at launch event for the Master’s Programme in Global Health at Sahlgrenska Academy Institute of Medicine, Wallenberg Conference Center, Gothenburg, 2016-08-29. Participation in session “Mål och planering för att nå ett klimatsmart transportsystem” at Transporteffektivitetsdagen 2016, Lindholmen Conference Center, Gothenburg, 2016-08-25. Participation in policy session “Climate and energy policy after the Paris Agreement” at the 22nd Annual Conference of Environmental & Resource Economics, ETH Zürich, 2016-06-24. Chair of dual plenary session “Energy and the economy: Sensitivity and expectations” at the 39th IAEE International Conference “Energy: Expectations and uncertainty”, Norwegian School of Economics, Bergen, 2016-06-20. Presenting “How to link heterogeneous climate policies?” at the Agenda COP21 High Level Forum at Hotel de Roquelaure, Paris, 2016-06-10. Presenting “Putting the Paris Agreement to work: Next Steps for Renewable Energy and for Developing Countries” at the fifth annual Alliance Summer School in Science and Policy titled “Complex Interactions in Sustainability” at Columbia University, Paris, 2016-06-07. Presenting “Changement climatique et autres problèmes de l’environnement” at College de France during the European Sustainable Development Week, Paris, 2016-06-02. Panel discussant at Nordic conference on economic models and their use in policy making titled “How policy relevant are climate-economic and macroeconomic models?” at Rosenbad Conference Center, Stockholm, 2016-05-25. Presenting at the conference “Skattereform i Sverige sett från utsidan” organized by Fores and LO at the Swedish Parliament, Stockholm, 2016-05-19. Keynote speaker at the inauguration of the Chaire Energie et Prospérité at École Normale Supérieure, Paris, 2016-04-27. Participation in policy session at the Tibergen Institute Conference “Combating Climate Change. Lessons from Macroeconomics, Political Economy, and Public Finance” at the Tinbergen Institute, Amsterdam, 2016-04-22. Presenting at the symposium “El cuidado de la Casa Común. Lectura desde la Economía” at Pontificia Universidad Javeriana Bogotá, Colombia, 2016-04-18. Presenting “Vad betyder klimatavtalet från COP21 i Paris?” at the Gothenburg Science Festival, 2016-04-14. Participation in Forum “Beyond COP21: What is your 2°C Business model?” at Château de Pizay, near Lyon (France), 2016-04-07/08. Presenting “Discount rates – putting a price on the future” at École Normale Supérieure, Paris, 2016-03-17. Presenting “Negotiating a tax instead of quotas: Understanding the national interest in negotiations about a harmonized carbon tax” at CERDI, Clermont-Ferrand, 2016-03-02. Presenting “The road to a low-carbon economy: what does it mean for policy?” at high-level launch event for Sustainable Development Solutions Network in Northern Europe (SDS NE) at Gothia Towers, Gothenburg, 2016-02-26. Panel discussant at launch event for Sustainable Development Solutions Network in Northern Europe (SDS NE) at Chalmers University of Technology, Gothenburg, 2016-02-25. Participation in “Internationell vetenskaplig hearing: Infrastrukturplaneringens roll för hållbara urbana transporter och minskad klimatpåverkan” at the Swedish Environmental Protection Agency, 2016-02-19. Presentation “Les effets distributifs de taxes locales harmonisées” at Palais Brongniart, Paris, 2016-02-19. Presentation “Global harmonized carbon pricing – looking beyond COP21” at Paris School of Economics, 2016-02-18. Presentation “Political economy aspects of harmonized carbon taxation” at the Economics Department at Université de Montpellier, 2016-02-11. Presentation “La COP21, échec ou avancée? Quels sont les prochains pas?” at Centre international de recherche sur l’environnement et le développement (CIRED), Paris, 2016-02-09. Participation in seminar “Les enjeux post-COP21: Comment concrétiser les ambitions de l’accord de Paris?” (“Post-COP21 issues: How to realize the ambitions of the Paris agreement?”) organized by Université Paris-Dauphine and Institut Louis Backelier, Palais Brongniart, Paris, 2016-01-18. Presentation “Refunding Emissions Payments” at Paris School of Economics, Paris, 2016-01-14. Participation in panel discussion “Equity impacts of carbon pricing and subsidy removal” on OECD side-event at the COP 21, Paris, 2015-12-08. Video session as a follow up to the inaugural lecture at Collège de France on the Menu of Policy Instruments, Collège de Fance, Paris (with audience located in l’Antenne Afrique des Grands Lacs à Bujumbura (Burundi), Abidjan (Côte d’Ivoire), Antananarivo (Madagascar), Hanoi (Vietnam), Réduit (Ile Maurice), Yaoundé (Cameroun) and Rumania connected via video), 2015-11-25. Presentation “Savoirs économiques et politiques climatiques” (Economic and political climate knowledge), Paris School of Economics, Paris, 2015-11-19. Presentation at EfD 9th annual meeting “Climate negotiations, renewable energy and sustainable development. The importance of EfD research in the right areas!”, Shanghai Marriott Hotel Changfeng Park, Shanghai, 2015-11-07. Participation in round table discussion at the conference “Environmental inequalities: From research to policy“, Paris School of Economics, Paris (France), 2015-11-03. Co-organizer of the symposium “Paris 2015 and Beyond, Cooling the Climate Debate“, Collège de France, Paris (France), 2015-10-28/29. Session leader of the seminars “Adaptation et Mitigation: l’Economie des Politiques Climatiques” and “Quel prix pour le carbone?” at Grenoble-Alpes University (UGA), Grenoble (France), 2015-10-14. Participation in round table discussion on Climate Action organized by Les journées de l’économie, Lyon (France), 2015-10-13. Presentation “Vart är världen på väg? Hur skall vi möta framtidens hållbarhetsutmaningar?” at the Prins Bertil Seminar 2015, University of Gothenburg, 2015-10-08. “Environmental Economics – pathways to a sustainable future” presenter at “Policies for the Anthropocene”, Sida Development Talks. Stockholm May 19 2015. “Pathways to Paris”: Is an (ambitious) climate treaty a) necessary and b) possible?” invited seminar at the Institute for New Economic Thinking, Oxford, Feb 12th. “High-Level Panel Discussion: Catalyzing a global research agenda on fiscal policy” Invited panelist at the Green Growth Knowledge Platform (GGKP) Third Annual Conference, “Fiscal Policies and the Green Economy Transition: Generating Knowledge – Creating Impact”, Jan 29 2015, Venice. “Theory of Refunding of emission payments”, seminar at the Ecole PolytechniqueParis, Jan 20, 2015. “Styrmedel för att hantera klimatfrågan”, Donatorernas dag, Handelshögskolan Nov 11, 2014. “Green fiscal reform and social equity”, presentation at the Green Budget Europe Annual Conference, 5th of November 2014, Norway House, Brussels, Belgium. “Future Paths for Climate Research” Presentation at the EfD 8th Annual Meeting, 25th of October 2014, Ledger Plaza Bahari Beach, Dar es Salaam, Tanzania. Organizing and presenting at the climate conference “Beyond IPCC – Future paths for climate research” 17th and 18th of October, at the University of Gothenburg, 2014. Framtiden för klimatfrågan, Keynote på Mistras 20 års jubileum, Fotografiska museet Sept 16 2014. ”Styrning mot klimatmål – nationella, regionala och internationella styrmedel” Stabilisera klimatet – utmaningar och lösningar. 12 maj 2014 Stockholm. “The Swedish carbon tax reform”. Presented at the Pricing Carbon Initiative network-wide meeting, December 3, 2013 at the Carnegie Endowment for International Peace, 1779 Massachusetts Ave NW, Washington, DC. “Natural Resource Management with particular focus on Shark management”, Invited plenary for the Cuban Government National Plan of Action on Sharks, La Habana, Nov 25, 2013. Invited presentation at the conference “What is the Value of Being First? Perspectives from the California and Sweden Experiences.” Proceedings from the Indigo, RFF, Climateworks conference in San Francisco, May 7, 2013. Organised by Dallas Burtraw. “Effectos sobre la distribución de ingresso de impuestos sobre combustibles” (Distributional effects of fuel taxation). Paper presented at the Workshop: “Taller de Trabajo Núcleo de Investigación en Economía Ambiental de la Iniciativa Científica Milenio. 14, 15 y 16 de marzo, 2013, Las Termas de Catillo, Chile. Thomas will be a keynote speaker in the 15th Annual Bioecon Conference on “Conservation and Development: Exploring Conflicts and Challenges”“Effectos sobre la distribución de ingresso de impuestos sobre combustibles” (Distributional effects of fuel taxation). Paper presented at the Workshop: “Taller de Trabajo Núcleo de Investigación en Economía Ambiental de la Iniciativa Científica Milenio. 14, 15 y 16 de marzo, 2013, Las Termas de Catillo, Chile. “Manejo sostenible de pesquerías”, (Sustainable Fisheries Management) III Encuentro sobre Manejo Comparido por Cuotas en La Paz, México Jan 22-24. “Behavioral economics and the Climate Challenge”, Invited presentation at the Zero Conference, Oslo, Nov 19-20 2012. Thomas Sterner was invited speaker at the Resource 2012 in Oxford held 12-13 July: Property rights are key for resource efficiency. Click to read more. See Thomas Sterner discussing ”Disruptive Innovation”– Sterner´s comments start after 20 minutes.Thomas Sterner participated in a debate on European Fisheries, Almedalen, Briggen Tre Kronor, Visby Hamn 3/7 2012, arrangerad av WWF (“FISKPINNENS FRAMTID– är utfiskningen av haven ekonomiskt försvarbar?”). Thomas Sterner spoke at European Parliament about managing fishing overcapacity on April 24 2012. It was a public hearing on the subject “The feasibility of Transferable Fishing Concessions in the context of Common Fisheries Policy Reform” organized by The Committee on Fisheries of the European Parliament. Read more. Thomas Sterner was invited to speak on environmental tax reform in the Assemblée Nationale in Paris on 15 March, 2012. 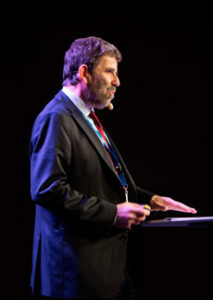 Thomas Sterner was invited speaker at the World Bank ABCDE conference held in Stockholm June 2010 on Green Growth and Climate Change. Please visit the Swedish ABCDE-site, www.sweden.gov.se/abcde2010, to find the Webcast on demand, scroll down and press “Environmental Commons and the Green Economy” – Thomas Sterner is introduced by the chair Paul Ehrlich, Stanford University. Sterner´s speech starts after 3:20 minutes.